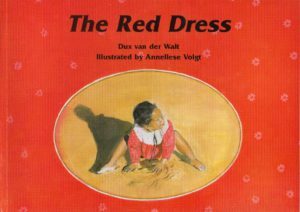 A picture book about a small African girl who puts on the red dress made by her Grandma before Christmas Day. She climbs through a barbed-wire fence, tears the dress, dirties it at the windmill, covers it with dust as she plays She tries to wash the dress but in vain. Grandma reworks the dress in time for Christmas. The full-page colour illustrations won the Vivian Wilkes Award 1997. It is a beautiful, simple, compassionate book true to rural life in Africa.